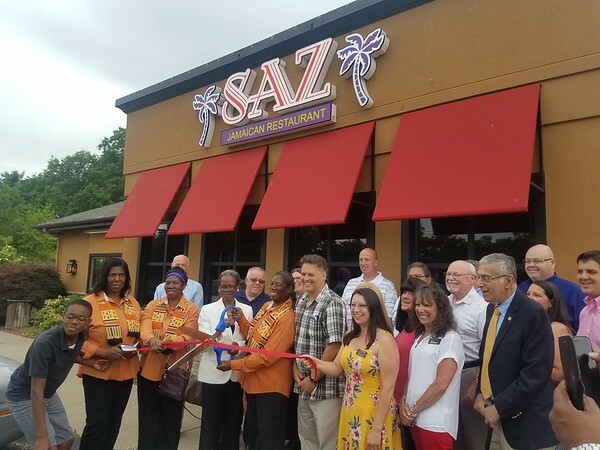 NEWINGTON - Mayor Roy Zartarian, members of the Chamber of Commerce and Dolores Campbell, owner of Saz Jamaican Restaurant, cut the ribbon at the restaurant’s recent grand opening. One of the restaurant’s workers, Camille Dennis, who is also Campbell’s niece, said her aunt has always dreamed of owning a restaurant, and seeing this moment come true makes her family very proud. Zartarian said he is happy to see a new restaurant in Newington. The restaurant opened March 12, and Dennis said that so far the feedback has been very positive, and that the restaurant’s staff takes the business very seriously. Gail Whitney, executive director of the Newington Chamber of Commerce, said she’s excited about the new business and wants it to be successful. Campbell said it has always been her vision to serve a healthy menu for the average person. She added that while she managed restaurants for many years, starting from scratch as the new owner is a challenge. Saz Jamaican Restaurant is at 2095 Berlin Turnpike, and offers vegetarian food, gluten-free options and authentic Jamaican cuisine. Some of the dishes served at the restaurant are curried chicken, zesty salmon, oxtail, Sazzy chicken, curried goat, soups, salads, and yard-style wings. The restaurant is open Monday through Thursday from 11 a.m. to 9 p.m. On Fridays and Saturdays, the restaurant is open until 1 a.m.
Posted in New Britain Herald, Newington on Sunday, 1 July 2018 20:53. Updated: Sunday, 1 July 2018 20:55.